Writing and giving a persuasive speech is easier if it’s on a topic you know and love. If you love horses, then write about them. The horse world has many controversial topics to work with and a even a few topics that might not be controversial but can still be the basis of a good persuasion. Pick your topic, take a side, do your research and deliver a winning persuasive speech. Although many schools have horseback riding clubs that encourage competitive riding, most do not consider horseback riding a sport. To argue that horseback riding should be considered a sport, focus on what makes an activity a sport. Research the calories burned during different horseback riding events including during training and what muscles are worked by the person, not the horse. Don’t forget to emphasize the amount of training and dedication required to be successful. Many types of techniques are used to break and train a horse, and most trainers will vehemently defend their preferred method. Choose a training technique such as natural horsemanship and do a little research. 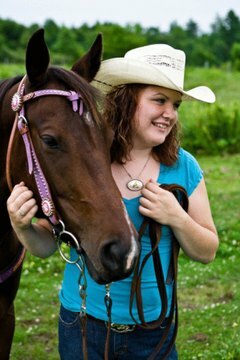 Personal interviews with local trainers will give you a wealth of information on why they prefer natural horsemanship over traditional training techniques or vice versa. Speaking out against horse slaughterhouses may seem like an easy persuasive speech, but you’ll need to remember to stick to facts and not rely on emotional pleas to persuade your audience. Also, while researching this topic, check into the repercussions of closing the slaughterhouses: horses sent overseas for inhumane slaughtering in foreign countries, horses set free in state and national parks and forests and horses left to pasture without proper care. This is an emotional topic with two interesting sides from which to choose. In the aftermath of the closing of slaughterhouses and no where else to send retired race horses, horse rescue facilities are full and in need of volunteers and supplies. A good persuasive speech on horse rescue should include information on the number of horses going through a local facility annually and the amount of money and number of man hours required to care for each rescued horse in order to inspire the listener to volunteer or donate.